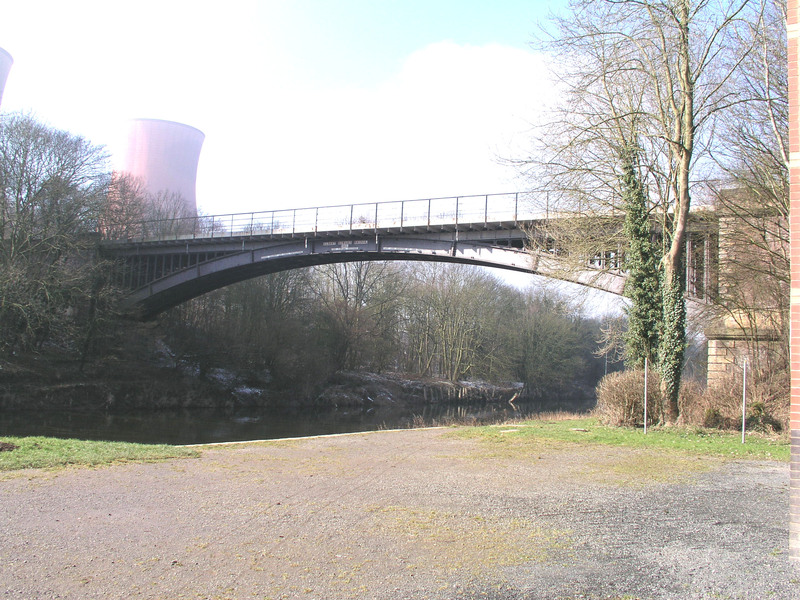 A cast iron single span double track railway bridge carrying the railway line from Shifnal to Ironbridge Generating Station over the River Severn. Segmental arch, span 201 ft, rise 20 ft. The construction of the bridge consists of four cast iron ribs each in nine segments, flanged and bolted together and springing from a webbed abutment bearing plate at 30° from the vertical against a massive brick abutment. The track ballast is carried on steel plates and RSJs supported from the ribs by open cast iron vertical spandrel struts heavily cross braced. The steel sheet and RSJ decking replaced the original timber decking about 1937. The ribs are of uniform I section 36 inches deep and with 12 inch wide flanges.